While usage of the 4 forward strategy is up, its adoption has been far from universal. Many clubs will use 4 forwards on their first unit, but stick to a more traditional 3 forward, 2 defencemen setup on their second unit. Since the start of the 2015-16 season (the first year in which 4 forward usage was greater than 3 forward usage) teams were 1.2 times as likely to use a 3 forward unit on shifts that did not start a power play. This decision is somewhat confusing because a team’s second power play unit often has a much more difficult task than their first unit does. Second units tend to start their shifts on-the-fly more often, requiring them to carry the puck down the ice and enter their opponent’s zone before they’re able to generate any offensive opportunities. These zone entry attempts are critical to success on the power play. And not all zone entries are created equal: controlled entries are far more effective than dump-ins at generating offense on the man advantage. In theory, forwards are better puck handlers than defensemen, and should be better suited to generating controlled entries. Forwards tend to get more opportunities to attempt zone entries at 5-on-5, and we’d expect this experience to produce players who are stronger at carrying the puck in. And when we look at the data, we see exactly that. Using Corey Sznajder’s zone entry data from the 2013-14 season, we can see that 4 forward units were more likely to execute a controlled entry at 5-on-4 than 3 forward units. How much value is there in these extra zone entries? The average team attempted roughly 732 5-on-4 zone entries in the 2013-14 season. The average second unit has received roughly 60% of the on-the-fly shift starts since 2010, so we can assume that they also attempted 60% of those entries, or about 439 per season. If a team that had been using 3 forwards on their second unit exclusively were to switch to a 4 forward setup, on average they’d earn an additional 35 entries. Given the differences in scoring rates between 4 forward carry-in entries and 3 forward dump-in entries, that works out to 1.1 goals over the course of a full season. That’s not a huge amount, but it’s not nothing either. At around 6 goals per win, that’s 0.37 extra points per year, just by switching the setup of your second unit. To put it another way, Michael Schuckers, Tom Pasquali, and Jim Curro estimated that a faceoff win on the power play was worth about 0.028 goals. At that rate, you’d need 39.6 extra faceoff wins on the power play to have the same impact as switching your second unit to 4F-1D. Given the amount that teams tend to obsess over ensuring they have a faceoff specialist on the PK, this seems like a much simpler way to give your team a small boost. So if there’s a clear case for playing 4 forwards on your second unit, why are so many teams hesitant to change over? One reason may be a desire to finish an unsuccessful power play with 2 defencemen on the ice, but that fact alone is likely not enough to produce a difference this large. Another factor may be that using two units with 4 forwards requires teams to have 8 forwards who are more talented than their third most offensively gifted defencemen. While for most clubs this probably isn’t an issue, teams who lack offensive depth or who have their bottom 2 lines setup as checking lines may lack the personnel to use 4 forwards on their second unit. In either case, the argument for using 4 forwards on your second power play unit remains fairly strong. With teams fighting hard for even the most marginal advantages, going all-in on the 4 forward setup is one way teams can give themselves an extra boost when scoring rates are already high. 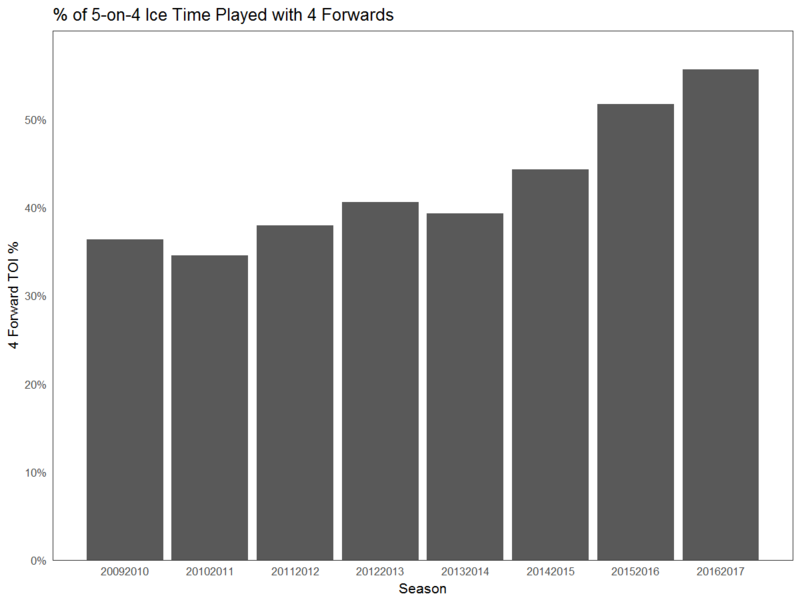 Somewhat frustratingly, 5 forward usage actually seems to be decreasing. Note that because we’re measuring only when the shift starts and not which units are on the ice we may be understating the difference in 4 forward usage between 1st and 2nd units. This also ignores the benefit of playing with 4 forwards off of a faceoff, so it likely represents the lower end of the estimated advantage. I enjoyed this article however am curious to see how 4 forward pp units perform vs traditional units in the years since 13/14 in zone entries as it will be important to have both a larger sample size and also see if defensive coaches better adapt to a now greater established strategy. I am also interested to see if lesser line talent (a team’s 5th through 8th best forwards) perform any poorer than the top pp unit in this success? Hoping updated results will be provided whenever they can be made. If the second unit switched to 4 forward and 1 D, would you still expect the second unit to have as successful entries as the first unit? The first unit theoretically is loaded up with the teams players that have skills most required for a successful PP. On a side note, as a Blues fan, which ever year was Stastny’s first year and Oshie’s last year with the Blues, Hitch loaded up the first unit with 5 forwards for a period of time. While I loved that group, the second unit I felt was lacking. But doesn’t it make sense to load up the first unit with as much talent as you can (possibly 5 forwards unless you have an offensively gifted D man like Shattenkirk), and then just try scrap together a second unit with whatever you have. For example if having 5 forwards on the 1st unit mean having a 3-2 set up on the second that could be better than having two 4 F 1 D units?